KANSAS CITY, Mo.--(BUSINESS WIRE)--Back in 1919, Hostess® began baking what has become America’s #1 cupcake. In celebration of this centennial milestone, Hostess Brands, LLC has launched Hostess® Birthday CupCakes, available for a limited-time-only as part of its annual CupCake Craze retail program. 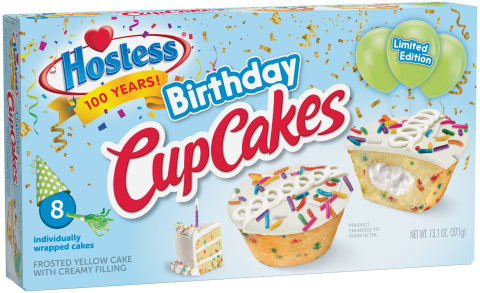 To kick off its 100th birthday – dubbed the “Hostess Sweetennial” -- Hostess has created Birthday CupCakes with the taste of everyone’s favorite party treat – birthday cake! The CupCakes feature golden cake with festive rainbow sprinkles baked inside and a decadent vanilla icing. Topping the treat are more rainbow sprinkles and, of course, The Original Squiggle®. The Birthday CupCakes are part of Hostess’ annual CupCake Craze, featuring several limited-time-only flavors. In addition to the new Birthday Cupcakes, CupCake Craze 2019 is reintroducing Hostess® Mint Chocolate CupCakes, a frosted chocolate cake with creamy mint filling, and Hostess® Strawberry CupCakes, a frosted strawberry cake with creamy filling. Hostess® Chocolate, Golden, and Orange CupCakes are available year-round. Each of the flavors are available nationwide, for a limited time, in multi-pack format with the Birthday CupCakes also available in single-serve. Hostess asks consumers to stay tuned for additional Sweetennial moments to partake in as the celebration continues throughout the year.